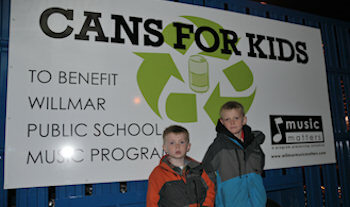 Cans for Kids at Cullens. Music Matters is a community group that supports quality music education and experience for youth in Willmar Public Schools. Our Willmar School District has faced many extremely difficult financial decisions and some of those have significantly affected our music program. There is currently no 5th grade band program. Advocating for more music instruction in the Willmar Middle School. Music matters gave a grant to Willmar Schools in 2008-2009 in the amount of $18,500 to reinstate AP music theory in the high school and maintain the level of music lessons at all levels. Music matters awarded a grant to Willmar Schools in 2010-2011 in the amount of $28,500 to reinstate the 4th and 5th grade orchestra which had been cut from the school budget. 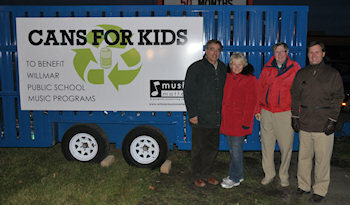 Music matters is awarding another grant for the 2011-2012 school year to again fund the 4th and 5th grade orchestra program in the amount of $28,500. Music matters awarded a grant for the 2011-2012 school year to fund the 4th and 5th grade orchestra program in the amount of $28,500. Music matters awarded a grant for the 2016-2017 school year to fund .5 FTE for 4th grade orchestra program in the amount of $15,000. Please consider making a donation to help provide supplemental funding to assure high quality music education in the Willmar Public Schools. Click on MAKE A DONATION for instructions to make your contribution.. The Music Matters fund is managed through the Willmar Area Community Foundation (WACF) and grant requests will be made directly to the Willmar Public School District for music program funding. All donations are tax deductible and donors will be provided with a receipt from Willmar Area Community Foundation (WACF). Contact our legislators and governor. 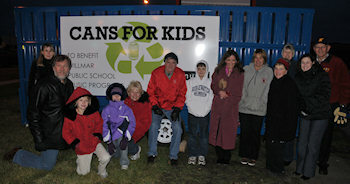 Thanks for supporting Willmar Public Schools! Walt’s Car Wash for offering a free carwash with donations and pledges going to Music Matters. A total of $20,500 was raised at this event. 954 cars were washed! Mills Ford for their partnership with the Music Department on their Test Drive event. For the past few years Music Matters has raised money through the sale of concessions at this event. Kudos to all who took a test drive and made this event a success. Richard Falk for the idea and keeping the ideas flowing. Gregg Hanson, Hanson Silo Co, for getting the trailer made and donating it. Jeff Bleess at Tire’s Plus for donating new wheels for the trailer. 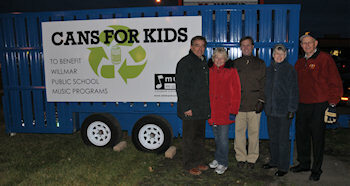 The project was organized by the Willmar Music Matters group.